Description: Conrail Shared Assets ME10's second wide cab Dash 8. Description: A pair of ex-Conrail now CSX GE diesels head up the Hudson River as it prepares to enter the tunnel under historic West Point Military Academy. Photo was taken from the tugboat I was working on at the time. Description: A CSX D8-40CW still in Conrail paint working the SA22 in Browns yard. Description: CSX 7315 leads V501 passed MP 221 on the CE&D Sub. Description: A CSX northbound passes the former ACL passenger station in Dothan. 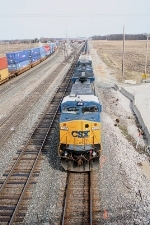 Description: A southbound lead by 3 UP units holds the main while a northbound goes toward yard trackage in this meet in the CSX yard in Dothan. Description: Unless CSX is detouring on NS, this is 36E waiting to get into the yard. Description: EB ethanol train pulls up on Royce Running Track. Description: A CSX still in Conrail paint, leads a westbound ethanol train across the Rockville Bridge. 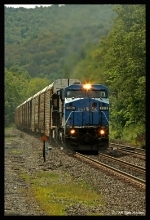 Title: Westbound NS freight 69Q at Altoona, Pa. Description: Westbound unit empty ethanol train passing through CP Tulp. 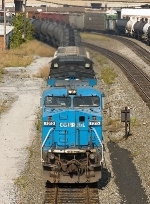 This is my first shot of an ex-Con with CSX road numbers. Description: Q283 blows for the Lower Valley Road crossing. Description: A quick stop back at Barr Yard on the way home yields this ex-Conrail and unknown lease unit sunbathing. 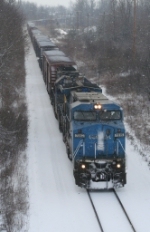 I shot this train earlier at Dolton as it switched off the northbound CSX/UP joint main but the shots came out like crap. Description: CSX Q62129 heads north. Description: CSX Q62129 heads north and the 8105 appears to have blown a turbo. Title: CSX 7315 on Q539-28 "Dark Future"
Description: CSX Q539-28 Clear Signal DeCoursey Building 12 Southbound to Waycross, Georgia. Description: 11 units head north on CSXs K&A sub.